Opinion Zone 65: Sonic Time Twisted Interview with creator Overbound Games! For fans living under a rock, Sonic Time Twisted is an unofficial Sonic the Hedgehog game that has been in development as a pet project for 12 years. But unlike a lot of fan game projects, this one was finished! To celebrate today’s release of the long awaited project, we sat down with the creator to discuss what is needed to push through to the end of such a long running piece of work. Not only that but we also discuss our thoughts on the finished project and if it is worth your time downloading! We also discover that the OST features a track very similar to another fans work in 2010, what does our (half hearted) investigation discover!? We also cover the last weeks news in Sonic (oh my did a lot happen this week!). Have you played the game yet? Let us know what you think in the comments! The spring season will likely pass as another dry spell for Sonic fans looking for a new classic gameplay fix, as SEGA delayed Sonic Mania to the summer. To their relief, however, one long-anticipated fan game finally saw a timely launch for Windows earlier today after many years of work and several SAGE demos. Developed by Overbound, Sonic Time Twisted boasts a number of Genesis-era features and callbacks, including CD-inspired time travel, a dizzying number of Zones to explore, and a variety of old and new elemental shields. The unique Dueling Ages soundtrack has also largely been composed and performed by Hinchy—along with collaborators Andy Tunstall, Joshua “EXshad” Kruszyna, Jogurt, Christopher Wright and Michael Davis—which you can download separately here. As for the story, the game’s events take place in a separate timeline after Sonic CD and the destruction of the Death Egg, this time leading to the demise of Dr. Robotnik. Metal Sonic aspires to resurrect his fallen master using ancient alien tech, and it is up to Sonic, Tails, and Knuckles to gather both the Time Stones and Chaos Emeralds to put a stop to the mechanical maniac’s fiendish plot! Be sure to check out the Overbound Studio website for more information and the actual download for the free fan game. 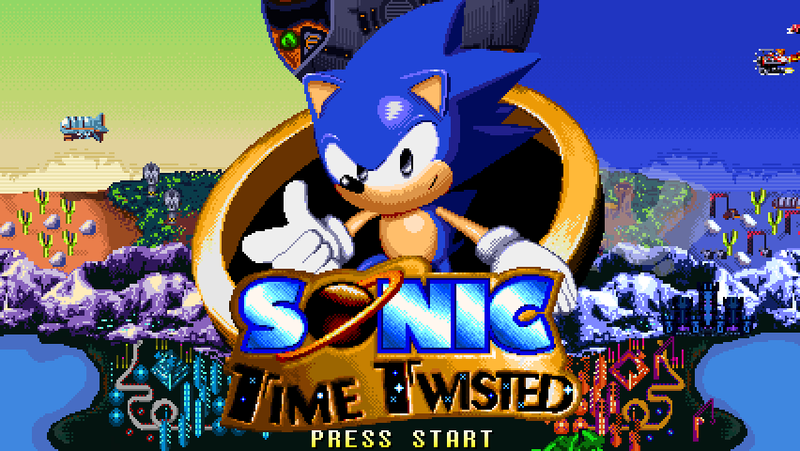 A Mac-supported release for Sonic Time Twisted is also pending. Have you been keeping track of this game’s development, or will you be going in with a fresh pair of eyes? What have you enjoyed most from Time Twisted so far? Share your thoughts with us in the comments below!